Pallas Kunaiyi-Akpanah goes up for a layup. The junior forward and the Wildcats fell to Milwaukee on Sunday. The third time was not the charm for Northwestern on Sunday. 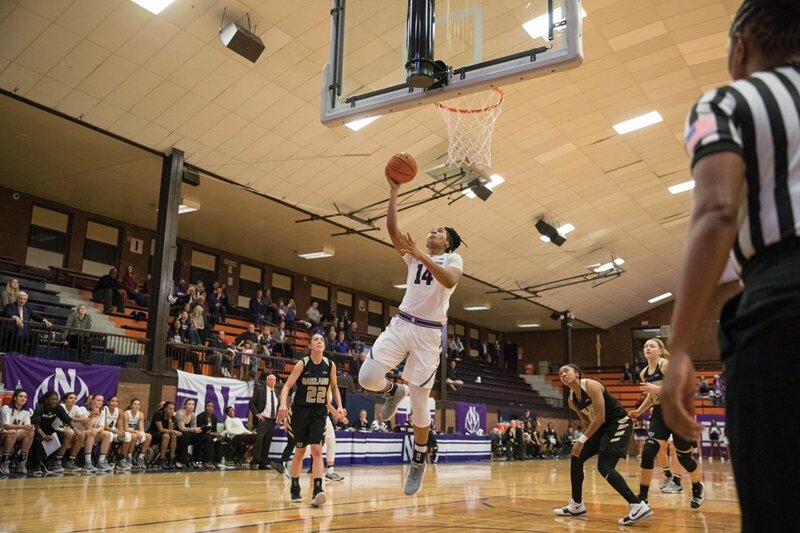 The Wildcats (5-4) fell to Milwaukee (5-2) at Beardsley Gym 66-57 for their third straight loss. Sophomore forward Abi Scheid led NU with 15 points in 39 minutes, but the Cats allowed the Panthers to shoot 26 free throws — nearly three times as many as NU — and fell at home for the first time this season. After scoring a career-high 29 points in the Cats’ loss at Syracuse, freshman guard Lindsey Pulliam tallied just 8 points on 3-of-11 shooting against Milwaukee. Despite the rough outing, Pulliam remains the team’s leading scorer, averaging 15 points per game in her first collegiate season. NU won its first five games of the season, but wasn’t really tested before the Challenge in Music City, where the Cats went 1-2. After Sunday’s loss, NU has now lost four of its past five games. Last season, the Cats bested the Panthers in Milwaukee, and then-senior forward Nia Coffey led the way with 17 points to lead NU. But as has been the case this season, the Cats struggled without Coffey, and were outrebounded by the Panthers on the day. Junior forward Pallas Kunaiyi-Akpanah registered a double-double with an efficient 13 points and 10 rebounds in 22 minutes, but it wasn’t enough. NU only played eight players and had its starters play heavy minutes, as Pulliam tallied 37 and freshman guard Jordan Hamilton logged 36 in addition to Scheid’s 39. The Cats will get a week off for finals before returning to nonconference action against Stony Brook on Sunday. NU will play four of its next five at home as it finishes off the nonconference season before taking on Minnesota to open Big Ten play on Dec. 28. McKeown said the Cats have to be prepared for tough nonconference tests, even at home.